It's that time again! Time to spotlight some of the Knickernappies Sightings around the world wide web. Enter to win a Knickernappies Onesize Cloth Diaper w/ 2 Inserts courtesy of The Diaper Wagon over at Luvn Life Blog! While you're there read Sarah's great review of the KN OS and be sure to check out her adorable pics of her daughter Emma in her Chocolate diaper! You also don't want to miss April's review over at the WeeLittleChanges Blog! She loves the Onesize combined with the use of LoopyDo Inserts and/or SuperDo Inserts. She's found a great system for getting her little guy through the whole night without leaks. Be sure to head over there and read more about her experience with KN Products. While you're there don't forget about WeeLittleChanges Knickernappies Giveaway. Enter while you still can, the giveaway ends May 13, 2010. Been over to the Cloth Diaper Whisperer Blog lately? If so you might have noticed our Fan Photo Contest featured yesterday! Plus, in honor of Earth Day they're offering 15% off storewide today! That includes Knickernappies products! Make sure you take advantage of this great deal. Clover and Violet: Our Blissful Lives has another great OS review! Plus, check out the simply adorable photo of her little guy sporting his new Knickernappies diaper! Want to vote for him? Check out our Fan Photos! 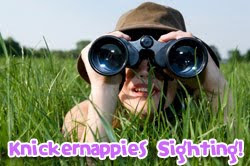 Stay tuned here at the Knickernappies Blog and we'll update you with more Knickernappies sightings and Earth Day specials as we become aware of them! I reviewed the one-size diapers on my blog as well (pics as well). I love them!